Celebrating four decades of industrial quasi rock noise, the influential Killing Joke bring their Laugh At Your Peril world tour back to the UK for four shows this summer. Supremely influential and still going strong after forty years the industrial, goth, electro quasi rock of Killing Joke has been pummeling senses without mercy throughout. Their musically out there approach to rhythm, riffs and imagery informing the careers of bands from Metallica, Nine Inch Nails and Soundgarden through to My Bloody Valentine and LCD Soundsystem. This rampant eclecticism is no accident, frontman Jaz Coleman has written an opera for The Royal Opera House and had his compositions performed by Nigel Kennedy and Sarah Brightman, not to mention the five hundred word tome on permaculture published in 2014. 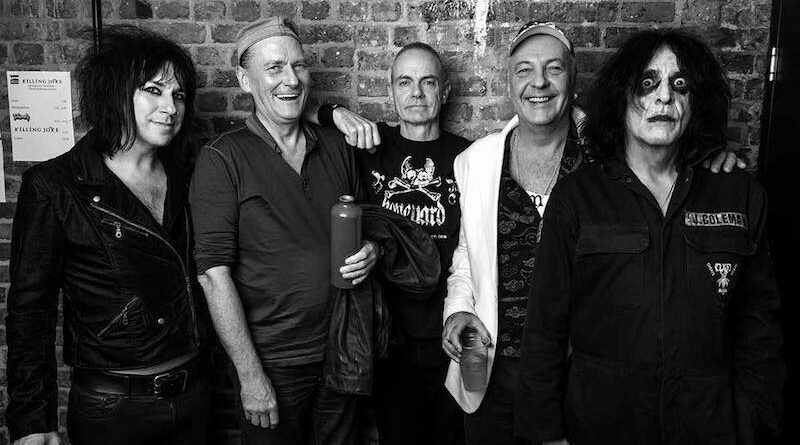 The band’s latest project, Symphonic Killing Joke, features reinterpretations of classic Joke tunes performed by the St. Petersburg State Symphony Orchestra, fans can get involved with the project at PledgeMusic. The current lineup includes all four original members; who may be much older but no less sharper, as the title of their world tour declares, Laugh At Your Peril. On the road since last September, including a brutal show at the O2 Institute, the Joke juggernaut lumbers back into these parts in August as a relentless world tour winds down, with KK’s Steel Mill being a suitably monikored home for their industrial strength noise.